Leonard Steinhorn is a professor of communication and affiliate professor of history at American University, a CBS News political analyst, author of The Greater Generation: In Defense of the Baby Boom Legacy, and co-author of By the Color of Our Skin: The Illusion of Integration and The Reality of Race. 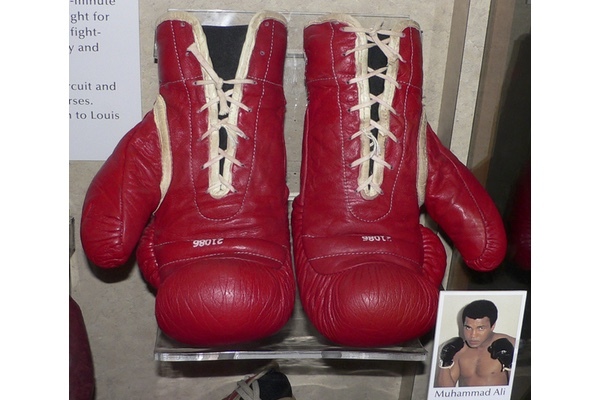 Muhammad Ali's boxing gloves are preserved in the Smithsonian Institution National Museum of American History. Time stopped for all of us on March 8, 1971, or so it seemed. It was the Fight of the Century, Muhammad Ali versus Joe Frazier, Ali seeking redemption after three-and-a-half years of professional exile for resisting the Vietnam War draft. The actual fight may have taken place inside a boxing ring, but it was about so much more than who would be crowned heavyweight champion. With Ali a symbol of black pride and anti-war sentiment, the ring was a proxy for the culture and political wars of the Sixties that would consume this country for decades to come. So this was not merely pugilism – it was a national event, two titans whose every punch gave voice to which side you were on. Yet as powerful a moment as it was, few of us could watch it live. The promoters limited the broadcast to theaters that screened what was then called "closed circuit television." Not even radio had the rights to carry it blow-by-blow. Most of us – who couldn't afford or obtain the live broadcast tickets – had to settle for radio recaps of each round. We waited patiently and nervously with trusty transistors in hand for the next summary, tension building even without a live account. Yet millions were transfixed – millions waited for an announcer to read wire copy of the fight – because it was an event that glued us together in the here and now no matter which fighter we supported. It's hard to imagine time stopping for anything like that today. It's hard to imagine almost every household in America – from small towns to city blocks to suburban neighborhoods – focused on a single event, tuning in to a single broadcast, one aired only on radio that wasn't even live. Yet that was America in 1971. There's no question our expanded media ecosystem today has given us access to information and entertainment unimaginable 45 years ago when the Ali-Frazier fight consumed our attention. And that's good assuming we use this access to make ourselves better informed and educated. But as we contemplate what we have lost with the passing of Muhammad Ali, perhaps it's important also to ask what we have lost when our culture and media have become so fragmented that time no longer stops collectively for any event or any news or anyone who captures our national imagination, assuming we have one anymore. In the 1960s and 1970s, the years of Ali's ascendancy, the three network evening news shows captured an 80 percent share of the audience, meaning that of all the households watching television during that time slot, almost all were tuned into the news. Nowadays it's barely 30 percent. In the early 1950s so many Americans gathered to watch I Love Lucy that communities reported a drop in water usage during the show and then saw a spike immediately afterward – essentially no one took a toilet break because they didn't want to miss a Lucy antic that everyone would be talking about. Sixty percent of adult Americans watched the finales of The Fugitive in 1967 and M*A*S*H in 1983. For the contemporary TV classic Breaking Bad, a mere 4 percent of American adults saw its series finale in 2013. The newspaper bound us together then, delivering to the front door or the newsstand the daily digest of American aspirations and concerns. We treated them as such sacred tablets of our times that people saved copies as mementos of historic or unifying events – as when our astronauts landed on the moon or when President Nixon resigned or when the Mets won the World Series or whenever Ali and Frazier fought. But today as a nation we don't have common sources of news and we don't have common experiences to share. Rather than read through a newspaper and confront news and information we didn't choose but need to know, people today personalize their newsfeeds and customize the information that comes their way. Rather than follow the judgment of editors trained to distill the nation and the world, we follow people on Twitter predisposed to confirm our worldviews and reinforce rather than expand our interests. What used to unify now splinters. How easy it is to swipe past an important story when something new grabs our short attention span. How easy it is to skim a serious issue when we and our friends have so much else on our minds. And because we share few collective moments and don't have a common media culture, we rarely hold the types of universal conversations that connected us with one another. And with few of these conversations it becomes harder and harder to establish the norms of mutual respect that humanize even when we disagree. Perhaps this fractured culture is why we have a Donald Trump today. And perhaps it was that common ground media culture of yesteryear – no matter how divided we were politically – that enabled us to see the grace and beauty of a Muhammad Ali. We are richer with information and media than at any time in history. The question is what we will do with it.